Chokeberry is an attractive multi-stemmed deciduous shrub that maintains great horticultural interest throughout the seasons. Beautiful corymbs of showy white flowers appear in April, and the leaves change to a bright red color as fall arrives. The glossy red fruits ripen in the fall and persist well into winter. These fruits are edible, but so incredibly tart that they may cause you to choke, rightfully earning this shrub’s common name as Chokeberry. Even the birds wait until it frosts for them to sweeten. Although it can withstand part shade, plant the Chokeberry in full sun for best fruit production. 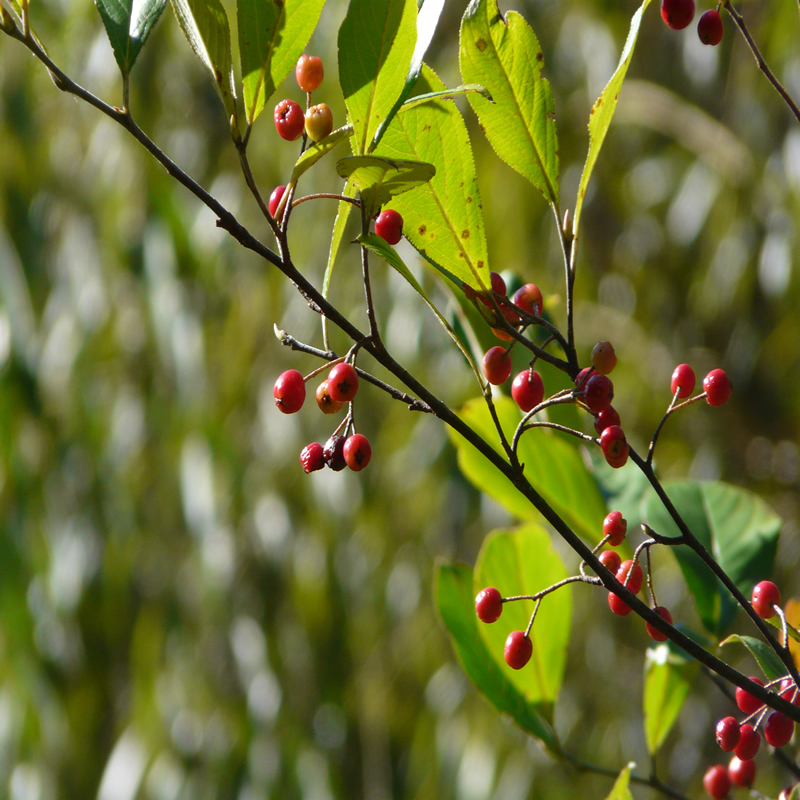 Chokeberry is a member of the Rose family and grows from Maine south to Florida, and west to Texas. It is hardy in zones 4-9, reaching 6-10 feet high while spreading 3-6 feet, developing into a vase shape in maturity. This shrub tends to sucker and form colonies. It can tolerate a wide range of soil types and it can withstand relatively wet conditions, as it often grows near wetlands. Currently there are differences in the accepted scientific names. The plant is sometimes referred to as Photinia pyrifolia, although here at Jenkins Arboretum & Gardens we accept and use Aronia arbuitfolia as its official name.